“Telluride is our favorite town in Colorado”, Sam and Joe said, two Colorado natives, and also our friends whom we met in Costa Rica last year. We grinned, picturing the postcard-perfect town, rugged mountains, and glacial blue alpine lakes that were to fill our days in Telluride. Telluride is a picture perfect town nestled within the mountains. There are countless trails in this area, and the rocky terrain makes it popular amongst rocks climbers. Telluride is a skiing town, meaning its busy months are during the winter. It is also only slightly cheaper than Aspen, so expect higher prices around this area of Colorado. 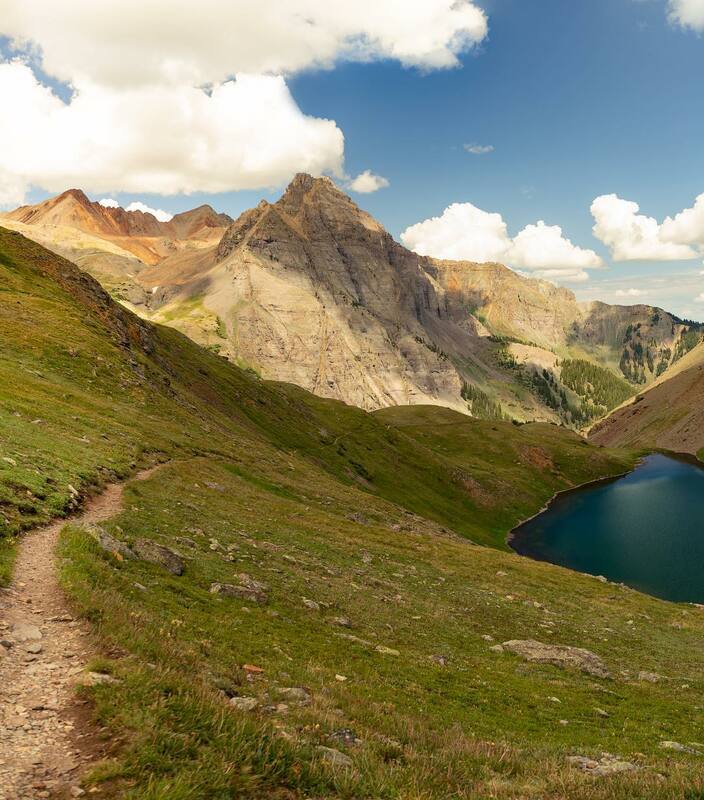 This challenging 6.6 mile roundtrip hike starts at nearly 10,000 ft in elevation, and gains over 2,000 ft during the uphill trek to lower lake. Sara enjoying sunrise at Lower Blue Lake. If you hike up to Blue Lakes Pass (including Middle and Upper Lake), you gain another 1,500 ft within only a mile and a half. But the views from above Lower Blue Lake on the way up are truly breathtaking, making it all worth it in the end! We camped at the base of the trail to acclimate to the elevation before setting out for the lakes. It is free to camp at both the trailhead, as well as the lakes themselves, and no permit is required. However, this means more crowds. Be sure to arrive early to get a camp site (both at the trailhead and the lakes). We started hiking up to Lower Lake around 8:30 a.m. and the parking lot was beyond full. By the time we got to the top, there were only a few sites left! The trail is about an hour and a half north of Telluride, near Ridgeway, Colorado. During the summer months, expect fields of wildflowers the whole way! Although we didn’t have enough time to do this hike, it is definitely on our bucket list! This 8 mile trail consists of three alpine lakes, turquoise and deep blue in color. This hike would make an excellent backcountry camping trip. Try to go early or during a week day, as this trail gets crowded, especially in the summer time! This stunning 4.8 mile hike follows a 4×4 road, but drive or hike, the views from up top are breathtaking! There’s also tons of rock climbing in this area. This 8.3 mile trail is a lesser-known gem in the area. Located an hour outside of Telluride, this spot is perfect for backcountry camping and allows you to avoid the crowds in the area. Plus, the deep blue color of the lake provides a unique contrast to the harsh, rocky mountains surrounding it, making it a great site for photography! Primarily used for off-road driving, this pass is the second highest drivable road in Colorado. Perfect for adventurers and thrill-seekers, this 17 mile point-to-point road will give you some stunning views of the surrounding mountains. It stretches from Telluride to Ouray. Mmmm. There’s nothing quite like wonderful colors, aromas, and tastes of a farmer’s market. Patrick and I love getting lost wandering through the various vendors at markets around the world. It’s honestly kind of an addiction.We enjoyed Telluride’s weekly farmer’s market downtown, and the friendly locals made us feel right at home! During the summer months, a farmer’s market is held twice a week: Wednesdays it is up in the mountains, and Friday it is held downtown. We visited the downtown farmer’s market during our stay in Telluride. Be sure to stop by Bohemian Spirit Designs for beautiful hand made jewelry made by Shea Williams. Earrings at Bohemian Spirit Designs. Pat enjoying the view from the free gondola. We are still baffled that the gondola is free here! We remember paying over $40 each for the Gondola in Whistler!! Yet the Telluride gondola was twice as long of a ride, going up to the midway point, and then down to the mountain town near the ski resorts. This ride is open late (we’re talking midnight on week days, and 2 a.m. on weekends), and therefore we recommend going during the day and also at night for two different perspectives of the town. On a clear night, expect to see stars above the mountain peaks, and get off at the midway point for the ultimate stargazing experience! Take the gondola up to this restaurant that sits 10,551 ft. above sea level. With breathtaking views of the box canyon, Allred’s offers contemporary American cuisine and a craft cocktail bar. Enjoy a one of a kind dining experience at the top of the gondola! This award-winning pizza spot is the perfect place to take the family! They won the title of “World’s Best Pizza” in Parma, Italy in 2015. This adorable bookstore/coffee shop is the perfect place to relax and read a book. Try their oat milk iced latte for a creamy, delicious midday pick-me-up! They also have live music on the back patio on weekends! This restaurant/bar sits in downtown Telluride. We visited during happy hour, and were happy with the extensive beer selection, all of which are brewed in house! Happy hour is daily from 3pm-5:30pm , and features $3 pints. There are numerous free backcountry campsites within a 2 hour distance from Telluride. Our favorite is Blue Lakes Trail, either at the lakes or at the base of the trailhead. Our camp site overlooking Lower Blue Lake. Elev. 1200 ft. The trailhead has sites you can pull your car up to, but the road there is a bumpy, 8 mile trip uphill into the Uncompahgre National Forest. All sites at the base are along a creek. We arrived early and scouted out the best site, which (in our opinion) is three sites away from the trailhead. You’ll see two horse tie-ups on your right, pull in here and make an immediate left (low clearance vehicles may have trouble on the rocky, uneven road). You’ll soon come to a col-de-sac, with a creek and a log bridge over the creek on your right. Cross the bridge and there is your private, secluded site (pictured below). Our site at the base of Blue Lakes Trail. There is also free camping on a lake just 20 minutes from Telluride. To get here, head south on State Hwy 145 and drive about 8 miles. Turn left on Forest Road #628 just before the turn into the Matterhorn Campground. There is a house on the corner of 145 and 628 that has a “No Trespassing” sign in front of the road, note that this is intended for their driveway, not the road itself! Forest Road #628 continues past their house to the lake and campground. Here are some AirBnB’s we’re obsessed with in Telluride! This rustic riverfront cabin that sleeps 4 for only $55/night! This adorable 2 bedroom mountain home that sleeps 6 in Ophir for $135/night. This modest townhouse in downtown Telluride that sleeps 4 people for $123/night. This studio guest home in Ophir with the most breathtaking mountain views for $124/night! Sleeps 2 people. Don’t have an AirBnB account yet? Enjoy $40 off your first trip by clicking here! This budget hotel is the most affordable in Telluride! Located right downtown, you can walk to the gondola and ski lifts from here. Rooms start at $138/night. Enjoy views of the river and the mountains with your furry friend at this pet-friendly hotel. Rooms start from $139/night. Rooms start from $179/night at this chic, rustic resort. You’re sure to feel one with nature at Mountain Lodge, an “oasis of alpine elegance”. Enjoy a total splurge at this luxury ski resort and spa located in the mountains of Telluride. Fairmont provides 2 and 3 bedroom luxury suites from a whopping $1,299/night! Named the “#1 Ski Resort in North America” by Condé Naste Traveler, Madeline Hotel and Residences gives you a truly luxurious mountain retreat. Guest rooms start at $239/night. This award-winning luxury resort is known for its friendly staff and homey atmosphere. Rooms start from $325/night. We hope you enjoyed this blog post on one of our favorite towns in America! Have you ever been to Telluride? What’s a small U.S. town that you absolutely love? Share below in the comments section! Like this post? Don’t forget to share on Pinterest!